It's new to get back into the swing of things. Michael is heading back to school tomorrow as long as weather permits and our girle will be heading back to college within the next couple of weeks. I honestly slept in all last week which I really get the chance to do. Let me just be honest, sleeping in for me is staying in bed until 9:00 am. I am an early riser by nature so at times it's difficult for me to sleep in no matter how late I stay up. One of the meals on this weeks' meal plan that I've never shared with you guys is a crockpot chicken and stuffing. One of the reasons that I've never shared this recipe is because it's really hard for me to get a good picture of the finished product. To be honest, it really doesn't look as good as it tastes and Michael has requested this meal and said that “I'm slipping” for not making it as often as I used to. Just warning you guys that it doesn't look Insta delicious but it is. Just me, I've been making it for years. I also tested out another recipe a couple of weeks ago that my family loved and I can't wait to share that with you guys too. Anywho, enough about me, any plans for the new year? This sounds like an awesome meal plan. I see a few dishes that I could make with ingredients that I have on hand now. What a great meal plan. Can you give any tips on how you stop the house from smelling like cooked fish? We both love fish but we love a clean smelling home too. 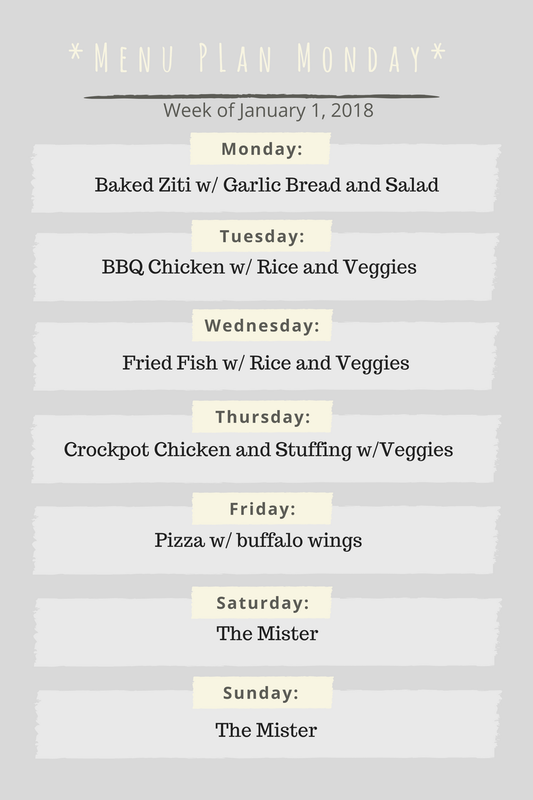 I'm vegan but I could definitely adapt this meal plan and substitute other ingredients for the chicken, fish, and buffalo wings! Thank you! Wow, great idea and some lovely meals there! I love my crock pot so I was happy to see your chicken and stuffing dish; I bet it tastes delicious! Aww bless you for sharing this! We usually meal plan for the month, with 2 weeks that repeat themselves. I desperately need ideas for new meals. I’ve never tried chicken and stuffing in the crockpot or together but it sounds yummy! This menu plan makes me hungry.I definitely like to enjoy all these meal ideas!